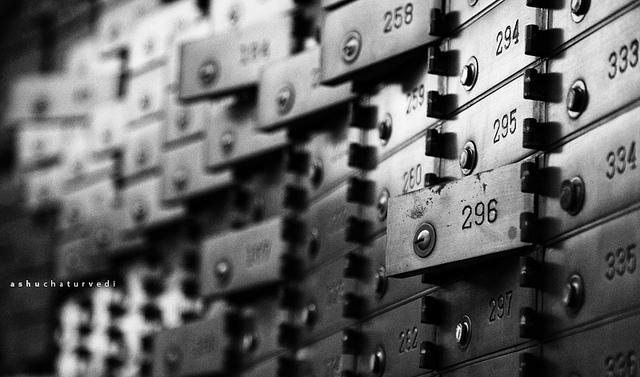 Safe deposit boxes – although widely talked about in movies – may not always be the first thing that comes to mind when thinking about your day to day banking. However, safe deposit boxes are an excellent choice for storing important documents, valuables and anything else that you might deem worthy of safekeeping away from your home. A safe deposit box is an individually secured container generally held within a larger safe or bank vault. Most often they are located at banks or other financial institutions and sometimes at post offices. Usually a customer will rent a safe deposit box and pay a monthly fee for using it. The box can only be opened with an assigned key. Different banks and institutions will have different regulations and rules for who will need to be present at the opening and which documentation is needed. Hotels, resorts and cruise ships will also offer a safe deposit box service to their customers for temporary use during their stays. Sometimes the boxes themselves will be behind a reception desk or a small safe will be anchored within the guest's room for privacy. Documents like deeds, wills and birth certificates, computer data or anything else similar that would need to be kept at an off-site location for added protection against theft, flood, fire or tampering of any kind. While safe deposit boxes are a convenient place to store valuable items it's not always the best place to store items that you would frequently, in case of emergency or after normal banking hours. Items like passports, originals of a “power of attorney,” and medical-care directives are not recommended to be kept in a safe deposit box. Documents such as the power of attorney or any medical-care directives should have copies made and the originals given to your attorney for safe keeping, while the copies are stored or given to a trusted friend or family member. TIP: Familiarize yourself with the laws in your state about who has access to your safe deposit box after your death if you want to keep your will in your safe deposit box. Some states allow executors, family members and co-renters to have access to the safe deposit box while others do not allow it and may require a court order. If you choose to rent a safe deposit box you can rent one with your spouse, child or another person and they will have unrestricted access to the box. However it's important to keep in mind that in some states, the co-renter may face delays accessing the box if you die. Also, giving someone a key to the box does not grant them access. Keep in mind if you fail to pay your rental fee for a number of years (depending on the state), your box can be declared abandoned and the contents given over to the government. Also, if the local, state or federal law enforcement agencies have reasonable cause they can obtain a court order, open your safe deposit box and seize the items inside. How safe are they, really? When storing your valuables in a place that you may not visit every day, you want to be sure that your stuff is going to be well protected. The companies that manufacture safe deposit boxes and the vaults they are kept in make them highly resistant to fire, flood, heat, earthquakes, hurricanes, explosions or other disastrous conditions. Keep in mind there is no 100 percent guarantee against damage. You can protect your items even further in your safe deposit box by taking precautions when storing them. Use zip-top bags and other air-tight containers to prevent damage. Be sure to put your name on each item (if possible) and keep a list of the items inside your safe deposit box along with extra copies of any documents and documentation stored inside. By law, the FDIC only insures deposits into deposit accounts at insured institutions – money into your bank accounts – so while safe deposit boxes do have the word ‘deposit' in the name, they won't be covered under the FDIC insurance and likely won't be covered under the bank's private insurance either. For insurance coverage against damage or loss, check with your homeowner's or renter's insurance and see if they will insure the items you plan on storing and what requirements need to be met. While it's always a good idea to keep important documents and valuables safeguarded against damage or theft, make sure to weigh all your options and find the solution that works best for you.